THOUSANDS of motorists are at risk of engine repair bills up to $10,000 following an influx of counterfeit oil filters into Australia. A major "sting" operation by two of Australia's biggest car makers - Toyota and Hyundai - has uncovered a racket that sells bogus parts in what appears to be genuine packaging. One importer alone was busted with more than 500 bogus parts for Toyota, Lexus, Hyundai and Kia vehicles. Following months of investigations and subsequent Federal court action by the manufacturers, the distributor agreed in an out-of-court settlement to contact customers and replace the counterfeit parts with genuine items. Surveillance images of a man accused of selling counterfeit car parts. Picture: Supplied. Experts in the automotive trade conservatively estimate there are "tens of thousands" of counterfeit parts in circulation in Australia but admit the true figure is impossible to calculate. "Unfortunately we don't know exactly how many of these fake filters with their dodgy materials have reached our streets. This seizure is just from one retailer, and involves over 500 filters," said Tony Weber, from the Federal Chamber of Automotive Industries. "What's of equal concern is that there is an entire industry of counterfeiters and criminals out there working on ways of evading detection and defrauding Australian drivers with bogus items which may appear genuine but clearly are not." Counterfeit oil filters were originally being sold by unscrupulous parts wholesalers who distributed them to independent mechanic workshops. But the industry has since detected bogus parts supplied by consumers trying to save a dollar by purchasing parts themselves online. The man was accused of delivering counterfeit car parts to workshops and selling to members of the public online. Picture: Supplied. "Counterfeit parts are becoming a major problem. We are now beginning to advise independent mechanics to be extremely careful when accepting parts provided by customers," said Brenton Daniel, a divisional manager of the NSW Motor Traders Association, with more than 30 years experience in the automotive industry. "Quite simply these counterfeit parts could lead to a catastrophic engine failure," said Mr Daniel. Saving $20 on an oil filter could end up costing between "$5000 and $10,000" on a reconditioned or new engine. "Many customers buy parts online thinking they're getting a good deal but are unwittingly buying counterfeit parts. Motorists are clearly unaware of the risks," said Mr Daniel. "If someone is offering genuine parts at or below half price, alarm bells should be ringing." The MTA says when an engine failure occurs the case can end up in court or a consumer tribunal. Can you pick the difference? Even experts struggle to distinguish the genuine part from the counterfeit. Photo: Joshua Dowling. "The consumer thinks it's the mechanic's fault when in fact it's later been determined the failure occurred as a result of a counterfeit part supplied by the customer," said Mr Daniel. "Motorists are unaware there is no consumer protection on bogus parts bought from overseas," he said. "They look like the genuine article and even come in packaging that looks original to the untrained eye." Oil filters - which cost from $20 to $50 depending on the car - filter out any impurities in the oil, which prevents the engine from seizing. 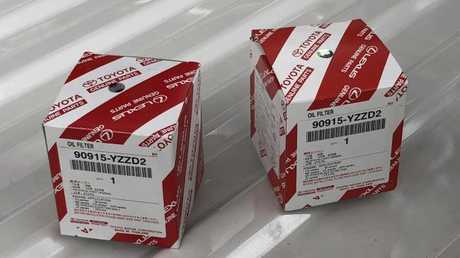 The filters seized in the undercover bust by Toyota and Hyundai were being sold online as genuine parts, and appeared to come in original packaging. However, testing found the bogus parts to be ineffective because they contained "inferior or unsuitable" filters and springs. 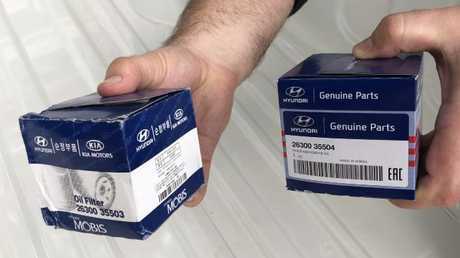 Hyundai and Kia oil filters were also caught up in the counterfeit scam. Photo: Joshua Dowling. The FCAI said surveillance uncovered the seller visiting mechanic workshops and "selling dodgy oil filters from the boot of his car". "Subsequent investigations led to the seizure of a commercial volume of counterfeit oil filters which were found to be highly sophisticated copies, almost identical to the genuine parts (on the outside) and illegally bearing the trademarks and branding of both brands," said the FCAI statement.